Today is Halloween costume making day. I’m under strict orders to “get cracking”! 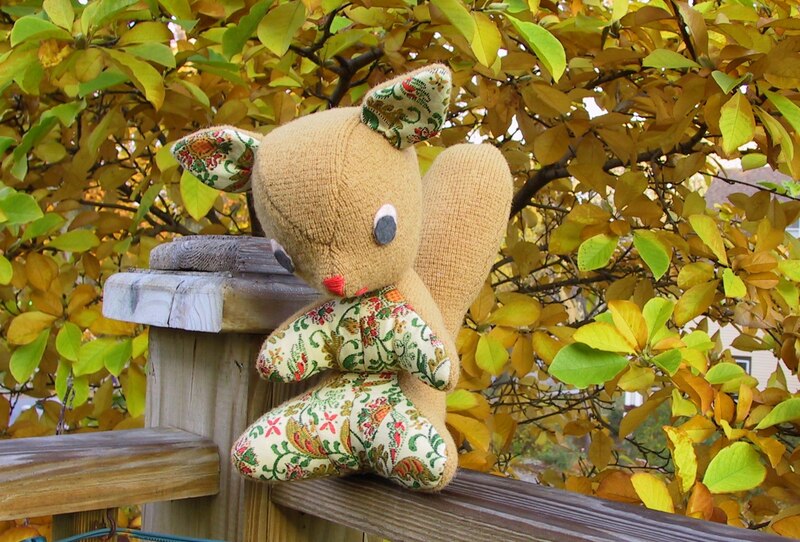 But I just had to make this cutie squirrel first. 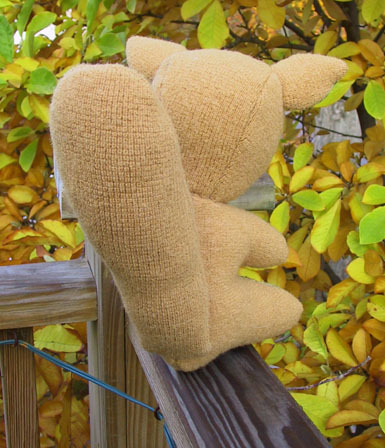 When I saw how wonderful the felted camel sweater and the feedsack fabric matched I just had to bump up Squirrel-y here to the front of the line. ok, now to tackle this bag of fur. Hopefully this is going to work out and I won’t need to make an emergency trip to the Target for a backup costume. Oh my gosh Hillary I almost died when I saw the squirrel! He has to be the cutest little guy I’ve ever seen! How do you do it? You continually make something that is cuter than the last impossibly cute thing you made. Thank you for that! darling little nut! But man! Hilary… you make me feel so incredibly UNPRODUCTIVE! I’m beginning to imagine that you’re Samantha Stevens. You twitch your nose and out of the air, in a shimmer of sparkles, pops something bewitching. The mere fact that you can tackle all of these incredible projects one after the other and care for young Oscar overwhlems me. Wow. You rock lady! I wish! I can seem to make time for the things I want to work on. I should be spending precious Oscar nap time picking up, washing things, cooking.. Just imagine how clean my kitchen floor would be if I was Samantha Stevens! Lovely site chock full of incredible craftiness! Can’t wait to see what you come up with re: Halloween costumes! ohmygoshohmygoshohmygosh!!!! how cute is that? you should have seen my face when the page loaded! good luck with the costume, can’t wait to see it! ps – i am going to scan a few crazy animal patterns i think you might like very soon, i am so busy right now! I keep reading your blog from quite a long now and I must say that I really admire your crafty skills! You are a sort of superhero for me, I would not be surprised if you suddenly reveal that you can teletransport or became invisible..hahha! That squirrel is really cute, the thing that made me smile a lot and I like it most is his angry little face. I love also the classy kitty with yellow shoes, and all the rest of your crafts. I have to admit this is the first Blog I’ve read that makes me want to blog myself. I love this blog! !keep up the good work….Oh and the nut man is adorable. So cute! I love everything you make!